Welcome back! I thought I would take a minute to go over our Master Bedroom Makeover. Shortly after I completed our Master Bathroom Makeover, our bedroom seemed to fall short. I have talked about this "syndrome" I suffer from. I have dubbed it the, "If You Give a Mouse a Cookie", syndrome! (Insert laughing face here) I spent less than a week and updated the wall color, the flooring as well as new nightstands and a bed! Let's take a quick look back at our bedroom before! Master Bedroom Before the modern farmhouse takeover! All in all, not bad! There are still many design elements that I loved! 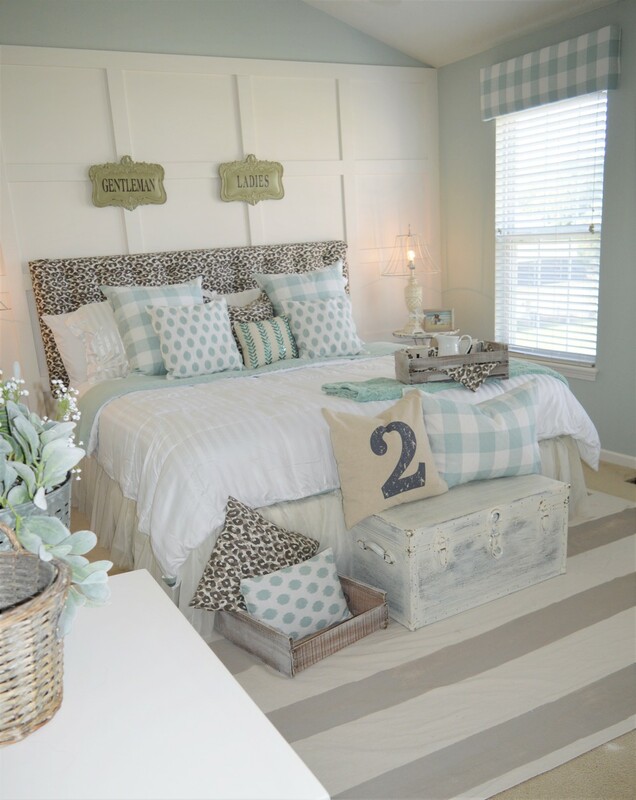 The pattern mixing was fun, I loved the soothing color combo and I had a lot of DIY projects in here that I am still proud of. If you'd like to go back and see the projects, click here! The biggest problem was just lack of cohesion with the new bathroom design. My goals were.... keep the paneled back wall in tack, replace the carpet with my plywood turned hardwood floors, replace the window treatments, update or replace the night stands, replace the ceiling light, and overall decor changes. Up first, rip out the carpet, paint the walls white (Ultra White in matte by Behr) and install the new light fixture. It already feels so much more open and bright! If you would like a complete, "how to" on the flooring, please follow this link. I brought up the white, fluffy rug from last years Christmas, family room decor and I love how it softens the new flooring! The light was a find from Overstock.com. The beads are the perfect match to the light, unfinished wood look that I am just loving right now. The next design decision was made after a trip to the furniture store! I was prepared to make a new headboard until I came across this beauty from Magnolia! For some reason, it was on clearance and I scooped it up! I'm sure you can see why I fell in love with it instantly! Thankfully we have vaulted ceilings so the canopy style only enhanced that feature. I dressed the bed in white linens with a mix of ruffles and pom poms. I added the buffalo check throw and pillow cases to tie the pattern in with the new bathroom floors. A couple brown, leather pillows tie into the leather fabric I used to recover my grandmother's piano bench that sits at the end of the bed. To dress the windows, I pulled together 4 curtain rods that I already had in a closet and spray painted them all black. I hung the rod brackets on either side of the windows so I could expand the curtain rod the 16 feet of my wall. This allowed the white curtains to flow from end to end which really softens up the wall space. I decided to replace rather than update, our night stands. You can see I chose to build simple pine boxes that I attached directly to the wall for a floating affect. I added some trim to the front and drilled a hole large enough in the backs to allow the electric cord to go through the back so we could plug in our alarm clocks! I also chose to add wall mounted lighting, to save room on the night stands. I simply re-wired the fixtures to allow them to become a basic, plug-in style lamp. This saves from needing to add wiring into the wall, a much bigger project! Here, at the other end of the room, I needed something to disguise and take away from, the TV. I realize this only helped a little, but these fun, hanging macrame plant hangers added some color and texture to the wall. They are each holding a faux succulent, ain't nobody got time to water plants int he bedroom! I now love the view from the bedroom to the bathroom, and vise versa! The complete, modern farmhouse vibe is just perfection to me! I feel so blessed to have such a wonderful space to begin and end each day! 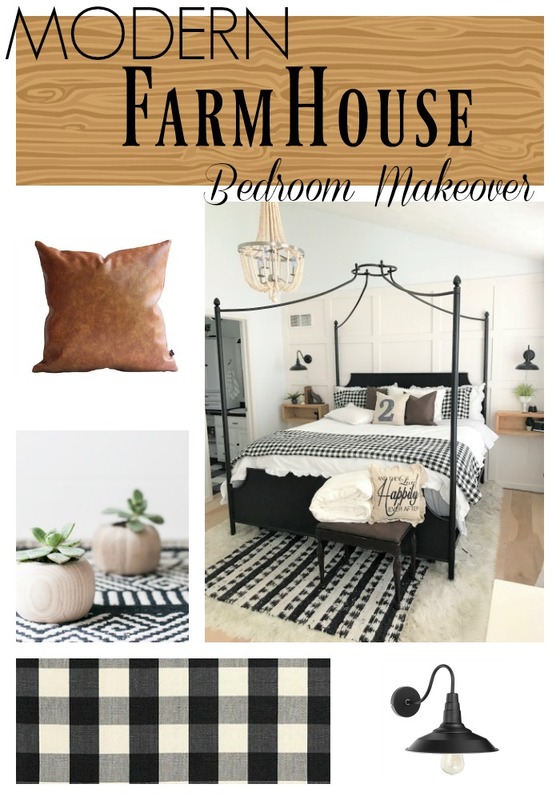 Thank you so much for taking the time to check out my Modern Farmhouse Master bedroom makeover! I truly appreciate each and every one of you! Please be sure to visit the menu button to check out my many tutorials as well as scroll back down my main page for other great DIY projects that YOU can complete too!